Hey guys! Just wanted to let you know that Disneystore.com is having a sale on some of their dolls and toys today, up to 30% off. Included in the sale are the singing "It's a Small World" DAC dolls, which are $10 off. This includes the new Mexico and China dolls! :) You can see all of the sale items HERE. Hey everyone! Hope your Saturday is going well. :) I just had a few quick updates for you. I also wanted to let you guys know that I have a few items up on eBay, mostly thrift store rescues and a few Frozen extras. I only have seven things up right now, but I'm hoping to do a few more listings tomorrow afternoon. You can see everything I have up so far HERE. 8. (Frozen Fan Art Postcard #1): Hannah H.
9. (Frozen Fan Art Postcard #2): Molly W.
11. 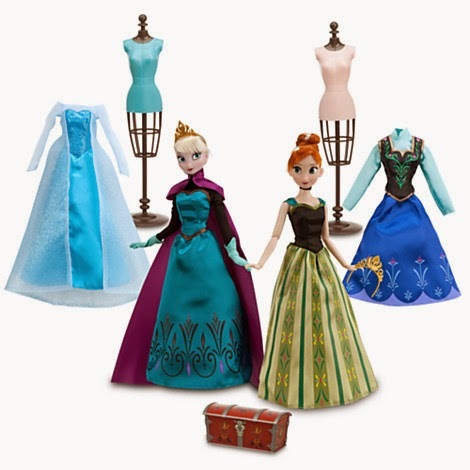 (Mini Elsa and Anna Dolls): Tracy G.
I will be contacting all of our winners via email later this afternoon/evening. The winners will have a week to respond via email with their mailing addresses. If I have not heard from them by Thursday, April 3rd at the very latest, new winners will be selected for the items the non-responsive winners won. To wrap up the week (rather than tackling that post that was giving me so much trouble the other night), I've decided to post some Frozen song covers on my YouTube channel. The first one is a cover of "Do You Want to Build a Snowman?" by Oldest Gal, Middle Gal, and Little Gal. You can see it HERE. The second video is my 1/2 cover of "Love is an Open Door" (just Anna's part). ;) What can I say? It's my favorite song and worked the best with my range. ;) I know, I'm weird. Hope you can enjoy it anyway. :) You can see that video HERE. The third and final video is my cover of "For the First Time in Forever". Not the greatest version you'll ever hear of this song, but I had a lot of fun recording it. It definitely gave me a singing workout, though. ;) You can see it HERE. For some reason, after teaching and running errands all day (not to mention cooking up a bunch of ground turkey to be used throughout the next few weeks), I'm not really in the mood to tackle a post tonight. ;) I'll have another Frozen-themed post up for you sometime tomorrow. Elsa is so much fun to draw! I love doing her light freckles and her large, expressive eyes. I may not have posted anything today, but I have done some other Frozen-related posts in the past. I thought now would be a good time to share those links so you have something to tide you over until tomorrow. ;) Enjoy! On Tuesday, I was thrilled to finally get my hands on my own copy of Frozen on Blu-ray and DVD. My copy was purchased at Walmart for $19.99. It included two discs: the Blu-ray disc with special features, and the DVD disc (which I haven't tried yet). The Blu-ray cover art is nice. It comes with a cardboard slip cover with iridescent accents. The blue tabs that were supposed to help hold the discs in place. :( I hope that in the future, the Disney company might consider investing a little more in their movie cases. The plastic was very thin and fragile, and I'm thinking this may have contributed to the tabs breaking off. This picture lists the special features included. I have to say, I was really disappointed in the lack of special features. I think the Disney/Pixar Blu-ray and DVD special features have spoiled me. I love it when movies come with an entire disc of extras. As someone interested in writing, acting, drawing, and music, I'm always fascinated by all of the behind-the-scenes information on movies and how they are made. Frozen's special features include the "Get a Horse" Mickey Mouse short that was released with Frozen in theaters, several "Let it Go" music videos (which I haven't watched yet because I prefer Idina's version in the movie), some deleted scenes, "The Making of Frozen", and a feature about "the company's 75 year journey to Frozen". From the titles, it sounds like there would be some pretty amazing information, right? Um...not exactly. Maybe my expectations were a bit too high, but I came away from watching the special features feeling disappointed. The deleted scenes were fun and interesting, but there were only four of them (I would have loved to see more!). They did have nice little intros by the directors, explaining why they were cut. And after watching them, I definitely feel like they made the right choice in leaving them out. They were good scenes, but the final cut works best. The "D'Frosted: Disney's Journey from Hans Christian Anderson to Frozen", which was supposed to span a 75 year journey, gave me the impression that it would be this incredible in-depth look at both Walt's era and the current movie. While the feature was interesting, it was not very long (twenty minutes or so at the most), and almost completely focused on the earlier attempts at the film. Even with that, the main bulk of the feature was a look at some of the concept art by Marc Davis, and featured some interviews with his wife, Alice Estes Davis, who designed the costumes for "It's a Small World", among other things. While the information there was interesting and informative, it left me wishing for more, especially about Frozen itself. The special feature I was most looking forward to was "The Making of Frozen", which was supposed to be a behind-the-scenes look at the movie set to music. And sadly, this was the special feature I was most disappointed about. It was great to see Josh Gad, Kristen Bell, and Jonathan Groff (who, as Kristoff, only got one short song in the movie, but has an amazing voice) singing and dancing together, along with members of the cast and crew at Disney Animation. There was even a short cameo from John Lasseter. :) Unfortunately, the song was very repetitive and didn't say all that much. (We've only watched it twice, but I'm already tired of it because of the amount of times my daughters have sung it around the house. I'd rather they just sing the songs from the movie.) But the biggest disappointment was that, aside from the visual walk-through of the studio during the song, there was absolutely no information about the making of Frozen. This was done on purpose (the song has a little "wink-wink" moment at the end that I won't spoil here), but I think I would have been able to appreciate the humor of it more if it had been followed with some actual information, or if the disc had at least had a separate feature that shared some "making of" moments. I also might have enjoyed it more if it was not called "The Making of Frozen". :} I was expecting this really cool behind-the-scenes feature staged as a musical, but if it had been called something else, I probably would have gone into it with the idea of just enjoying a fun song. I seriously doubt that anyone from Disney reads this blog, but if they did, I would beg them to consider adding more special features to their Blu-rays and DVDs. And while I'm dreaming away, how about some audio commentaries? I would love to have a cast and crew commentary on Frozen (and on Tangled too, for that matter!). Thankfully, in our computer-saturated world, we have other resources for bonus features. I figured that some of you might have been similarly disappointed, so I thought I would link to a few of my favorite online "bonus features" (since we didn't get many on the Blu-ray). :) Enjoy! If you're in the mood for still more Frozen fun, you can visit my Frozen Pinterest board HERE. Hope you guys enjoyed the post and the links. What are your thoughts on the Blu-ray? Any of us who have children (and some of us who don't) are very familiar with the most popular song from Frozen: "Let it Go". It's fun and singable and has a message that many can relate to. But is it the best stand-alone message? This song is a huge success for Disney, winning them an Oscar and becoming a world-wide phenomenon. Why is that? I think it largely has to do with the fact that all of us have some sort of personality quirk or flaw or some sort of issue we struggle with that makes us feel different and pressured by those around us to change. All of us have had days where we just want to say, "Forget it! I'm tired of trying to live up to everyone else's expectations. I'm just going to be me, and I don't care what people think!!" In my case, my biggest struggle would be my fight to control my weight. Because of my genetics, height, and build, I will never be able to attain today's standards of weight and beauty (not that I would necessarily want to go that far), even if I spent every waking moment focusing on it. On one hand, I could pull a "beginning-of-the-movie-Elsa" and hide myself away, obsessing and panicking about each little pound. And to be completely honest, sometimes I do act this way. There are days when I want to shut myself away in my room because nothing in my closet fits right and I feel about as lovely as a large dairy cow. I constantly try to gage what others think of my appearance and wonder if the older ladies in my church are shaking their heads over the fact that I've really packed on the pounds in the last year or so. That's one extreme. Then there's the "Let it Go" moment, where I get so frustrated with living this way that I say, "Forget it! I'm sick of dealing with this!! I don't care what anyone thinks. Forget rules, forget everything. I'm just going to be free and do what I want!!" (Which is essentially what Elsa is saying in her song.) And then I start eating everything in sight without a care in the world...or so I convince myself. Of course, in the back of my mind, I'm still thinking about how much I weigh and what others think and the fact that stroke and heart disease are rampant in my family. And a few weeks later, when I go up two dress sizes, I'm not going to feel so "free". That's the other extreme. Now, as fun as it would be to throw off all restraint and live the way we want to with careless abandon and without any consequences, most of us know that things don't really work that way. There are always results from our decisions, and to live in such extremes always costs us in the end. Technically, I am "free" to overeat and do what I want, but I have to be willing to pay the consequences. I have to be okay with buying bigger clothing. I have to stop complaining about my body size and the fact that I'm too out of shape to take part in the activities I used to. I have to be aware that my choices might affect my health in the future. But if I were honest with myself, I would feel more enslaved than free by this lifestyle choice. And just as I would not be truly free, Elsa was not truly free at the point of singing "Let it Go". Sadly, by the time her next song rolls around, Elsa realizes that throwing caution to the wind and hiding away from everyone has not solved her problem. ("I'm such a fool, I can't be free...") Once again, she is trapped by her fears, and she ends up hurting her sister in the middle of her breakdown/panicky moment during that song. I think we've all been here, too (or at least I have). When we throw off all restraint and live recklessly, we always pay in the end, whether it's that extra twenty pounds on the scale, or realizing we've unknowingly cursed an entire kingdom in eternal winter, or anything in between. :} And sadly, when we live this way, we often hurt those closest to us, without meaning to. But the beauty of "Frozen" is that Elsa's story doesn't end there. She eventually comes to a balanced conclusion as the film winds down. She doesn't have to hide who she is, but she has learned that holding everyone at arm's length and doing her own thing doesn't work either. By controlling her powers with the love she has for her sister, she is able to enjoy who she is in a healthy way. I will never be a size six. However, I don't need to go eat everything in sight just because that is unattainable for me. 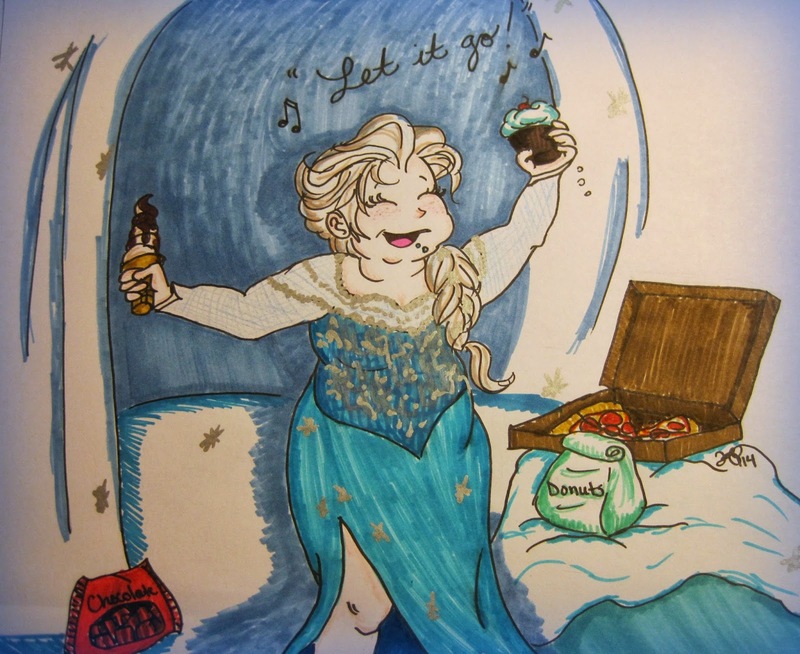 I need to try to eat right and exercise so I'm taking the best care of my body that I can, and then "let it go". ;) Let go of the fears and the obsession with numbers on a scale without letting go of the self-control. As a follower of Christ, I have the added blessing of taking these concerns and cares to my Heavenly Father. He is the best solution for the extremes I unnecessarily add to my life, and He always loves me in spite of my imperfections. 1. Who is your favorite Frozen character (or characters) and why? I really love them all, but I'd have to say my top favorites are Anna, Kristoff, and Olaf. I love Anna because she's so cute and awkward and just a normal, likeable person. I think she's the type of princess a lot of girls can relate to because she's not perfect. :) Even more importantly, just like Eugene and Rapunzel in Tangled, she is willing to sacrifice herself to save someone she loves. 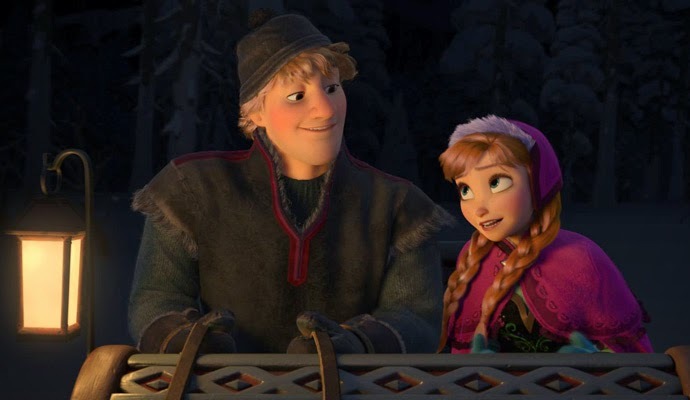 Kristoff is great because beneath his gruff exterior he's a big softie. I love that he's not the typical handsome prince you see in so many animated movies. 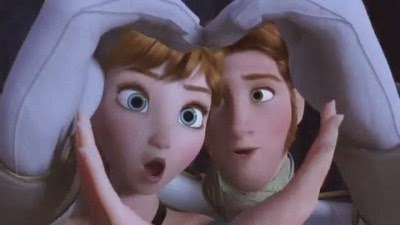 He and Anna are really cute together, and it's fun seeing their friendship progress throughout the course of the movie. I also love the fact that he is willing to let Anna go when he thinks that's what's best for her. Olaf is a character I did not expect to love. When I saw the previews, I assumed he'd be another goofy sidekick character, thrown in for comic relief and not much else. I was pleasantly surprised to discover the heart and depth to his character...and the fact that he was really quite funny. :) As an added bonus, he shared one of the best definitions of love: "Love is putting someone else's needs before your own..."
2. Which is your favorite Frozen song (or songs) and why? 3. If you could make one change to the movie, what would it be? 4. Would you want to see a Frozen sequel? What would you want it to be about? I would be interested in a Frozen sequel if it was well done, like the Toy Story sequels. As some of you have already mentioned, I feel that Frozen does well as a stand-alone, and I would hate to see that ruined by a less-than-stellar sequel. I'm sure Disney is looking for ways to make the most of this franchise since it was such a big hit, but the story and the characters have to be there to make any additional films a true success. There have been too many disappointing Disney sequels in the past that have almost ruined the originals for me, because I always think of the sequels when I watch them. On the other hand, if they chose to focus on Elsa and Anna once more, there could be a great story there. Think of how interesting it would be to see their relationship grow now that they could be together again. It would be nice to see a little more development of Elsa's character, too. 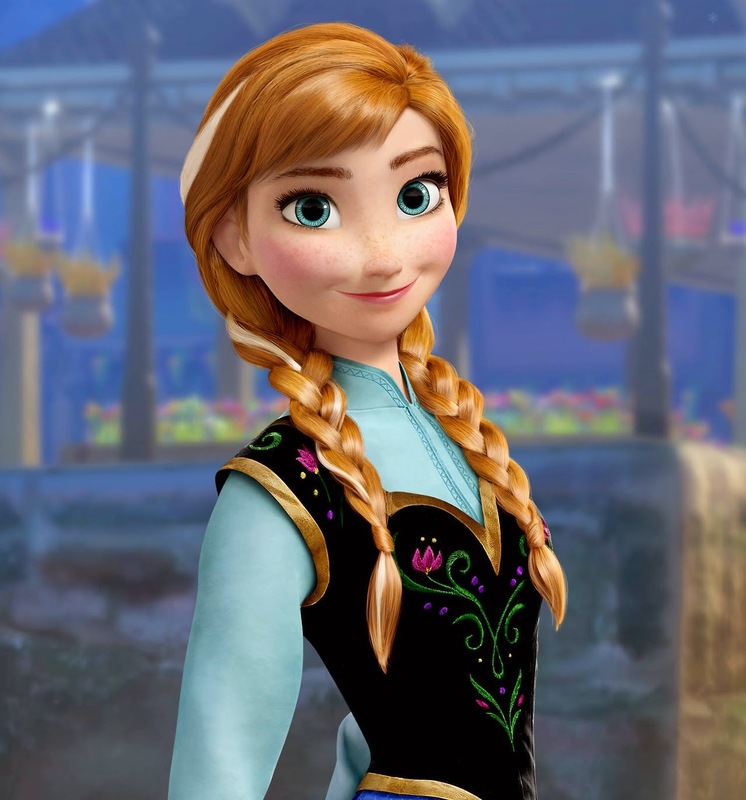 While Frozen was about both of them, a lot of it focused on Anna (which I didn't mind). Maybe the second film could focus more on Elsa. I have to say, though, I kind of like leaving the ending the way it is. It gives the audience the opportunity to come to their own conclusions about what happened after the movie. And you know, to avoid all of the possible disappointment, how about this great idea from someone on Pinterest? 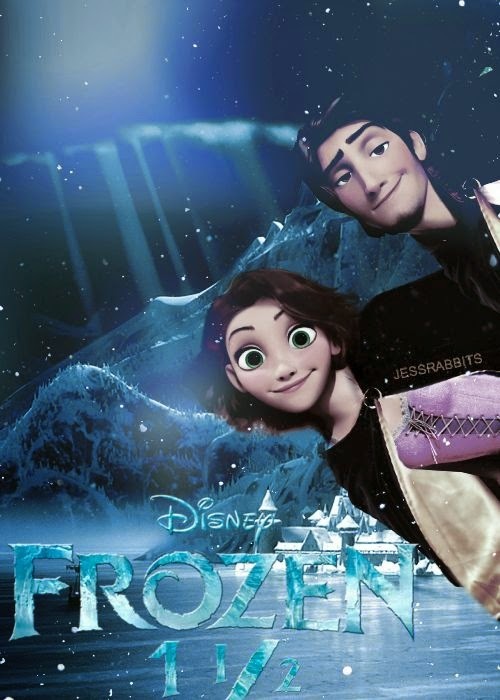 A short sequel all about Rapunzel and Eugene's time in Arendelle. How cool would that be? :D I would pay to see that movie! 5. Ice Palace or Arendelle Castle? 6. 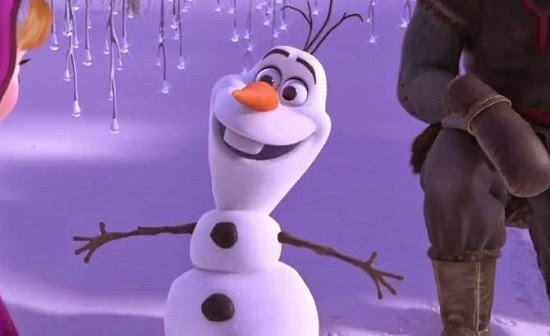 If you could choose a sidekick from the movie, would you choose Sven or Olaf? Why? 7. 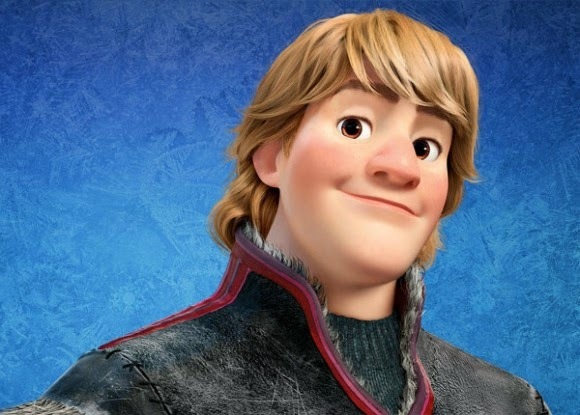 Do you think all men pick their noses, as Kristoff claimed? 8. Which Frozen character is the most like you (or the one you relate to most) and why? 9. How many times have you seen Frozen so far? Stay tuned for more Frozen fun, coming soon! It will come in this cute little baggie, just the way she sent it to me. It will also come in its own baggie. This picture gives you an idea of the size of the key chain. This one was a complete surprise that she threw in without telling me. It was so sweet of her...and such a fun discovery when I opened the package she sent. :) The necklace has ribbon and cord for the chain and has a clasp at the back. It will come in a baggie like Belinda's items. Here it is in the baggie. This gives you an idea of the size of the charm. Both Etsy sellers went far above and beyond what I asked. I'm so thankful to both of them for donating all of these items to make our giveaway extra special. :) Thanks so much, Belinda and Elfie! I hope that all of you get a chance to stop by their Etsy shops and check out their other goodies. And now for our final giveaway item. Because this prize is slightly larger than the others, this particular prize will only be available to my readers in the United States. Sorry guys, I just don't want to try and figure out International shipping for these. These are the mini dolls, around 4 inches tall, with MagiClip dresses. They will be given away as a pair, not individually. 1. This giveaway is open to all of my readers except for the 11th prize listed (the mini Elsa and Anna dolls). Those will only be given to a reader within the United States. 2. If you are under 18, please get a parent or guardian's permission to enter, as I'll have to get your mailing address. 3. To enter, leave a comment on this post with your name or username, email address, and the country you're from. Comments with email addresses will not be published. If you are already following me on any of the sites listed above, you can count that towards your extra entries. Also, while answering the Blog Party Questions gives you an extra entry, it is not a requirement for entering the giveaway. Be sure to leave a comment on this post telling me what you did for your extra entries so I can count them. 4. Important: Doing the above increases your chances of winning. However, to keep things as fair as possible, there will be a limit of one prize awarded per winner. So if I draw your name a second time after you have already won something, I will redraw for the second prize. 5. To keep things simple, I will not take requests for specific prizes. I'm assuming I will have quite a few entries, and trying to keep who wants what straight is just going to be a bit too complicated for me. :} Everyone who enters will be entered for everything (although my out-of-the-US readers will not be entered for the two mini dolls). 6. The contest will be open for entries until Wednesday, March 26th. On Thursday, March 27th, the winners will be chosen by random drawing. The winners will be notified via email and will have one week to respond with a mailing address. If I have not heard from the winners by Wednesday, April 2nd, new winners will be selected. Announcing Never Grow Up's "Frozen" Blog Party! !